Joel Conlon is hoping to have more of an impact at Premiership champions Saracens this season after a long spell out with injury. The back-rower believes he can create more first-team opportunities for himself during this pre-season as he returns from a frustrating period on the sidelines following numerous back problems. The 24-year-old was delighted to be back in action last weekend as he captained Sarries to the Premiership 7s title at Franklin’s Gardens. Conlon’s senior debut came back in 2012, but now he is fully fit, he is relishing the challenge of claiming a first-team spot. A huge well done to #PremRugby7s winners @Saracens !!! ?????? They've lifted the Cup?? at the #PremRugby7s here at Franklin's Gardens to go with their league title won at Twickenham in May?? “It is really nice to be back,” Conlon said. “It has been a frustrating season and a half or so with injuries so hopefully it is the end of that. “Hopefully, I can put a good pre-season together and progress and play some games to give myself a good opportunity to impress. “I just want to be as consistent as I can be in training and in games. The coaches have said what they want to see so I need to make sure I am working hard to give myself a chance of getting into the first team this year." After success in the Premiership final back in May, Saracens began the new term by adding another trophy to their cabinet following a 33-12 victory over Wasps last Saturday. 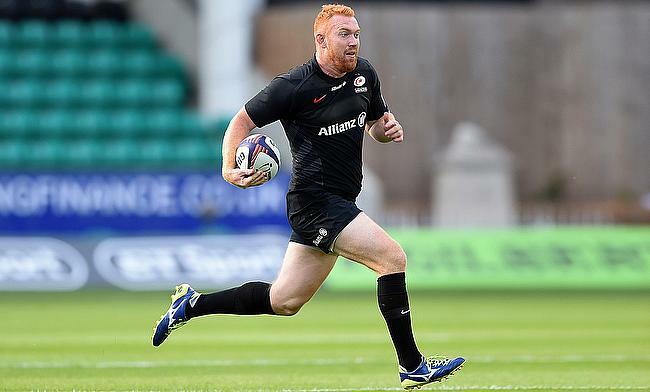 Conlon led by example scoring twice in the final to seal the Premiership 7s crown and the flanker says the triumph only adds to Saracens’ progress. “I think winning has become a bit of habit over the last few years for Saracens,” he added. “Obviously, we had a good year last year with winning the Premiership so especially for myself and the younger lads, to be on the frontline and win the Sevens trophy was great. “We didn’t really do much training for the Sevens. It was a case of using what we had learnt in pre-season and talking through it. It was mainly about applying those process into the tournament and working hard. Saracens’ attention now turns to the XV-a-side game with pre-season matches against Bedford Blues and Ospreys to come this month, before beginning the defence of their Premiership title away at Newcastle Falcons on September 2nd. Mark McCall’s preparations for the new campaign were boosted this week after both Mako and Billy Vunipola signed contract extensions at Allianz Park. ?? Breaking | @Mako_Vunipola and @bvunipola have penned contract extensions until 2022! #TogetherSaracens ???? Conlon works alongside Billy in the back-row, but he is happy both brothers have continued their stay with the Premiership champions until 2022. He added: “Billy and Mako are great have around the club. A lot of squads base their cultures around ‘brothers’ so it good to have them signing on again. “They are both good off the pitch as well and especially for the young lads coming through, they offer a lot of experience and advice. It’s good to see them staying for a while.